I am a retired Chemical Engineer who has been growing fruit trees and pecan trees for 49 years in Lake Jackson, Texas. In my half acre backyard, I have peach, guava, banana, pecan, pear, loquat, avocado, sapote, passion fruit, pomegranate, fig, jaboticaba, and persimmon trees, growing. I also have a year around vegetable garden. I believe I have the largest private collection of citrus in Texas with over 200 varieties including lemons, limes, grapefruit, pummelos, tangerines, mandarins, and kumquats, plus many hybrids. I am a member of the Southern Fruit Fellowship, and a life member of the California Rare Fruit Growers Association, plus having been past president and editor of the Brazosport Garden club for a number of years. I have taught master gardener classes for the Brazoria County Extension Service, and I am also a past member of the Brazoria County Pecan and Horticulture Committee and past chairman of this committee. I have given citrus and gardening talks for Brazoria, Harris, Fort Bend, Denton, and Galveston extension services, commercial nurseries and other organizations. At my home in the spring, I teach grafting and plant propagation classes. I also have a small persimmon orchard in New Caney, Texas, where I have about 150 persimmon trees. From time to time, I sell fruit and various types of trees that grow in this area. “Growing Citrus in Texas”, “Discover Why It’s So A-peeling” Austin-San Antonio Urban HOME” Dec13/Jan14 p. 70. 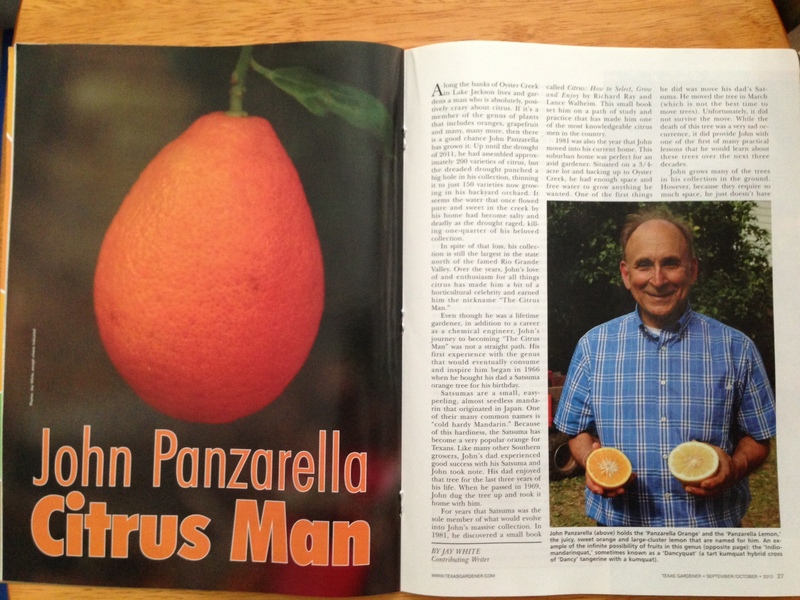 “John Panzarella Citrus Man” Texas Gardener, Sept/Oct. 2013 pp. 26-31. Opening Lines “Searching for Citrus” Texas Gardener, Jan/Feb. 2012 p. 4. “Enjoying fruits of his labors” The Houston Chronicle Dec. 12, 2008. “Citrus City USA” The Facts, (Brazoria County Newspaper), Jan. 22, 2006. “Miracle fruit, A Taste Twister” Fruit Gardener, CRFG Magazine, Jan/Feb. 2005. 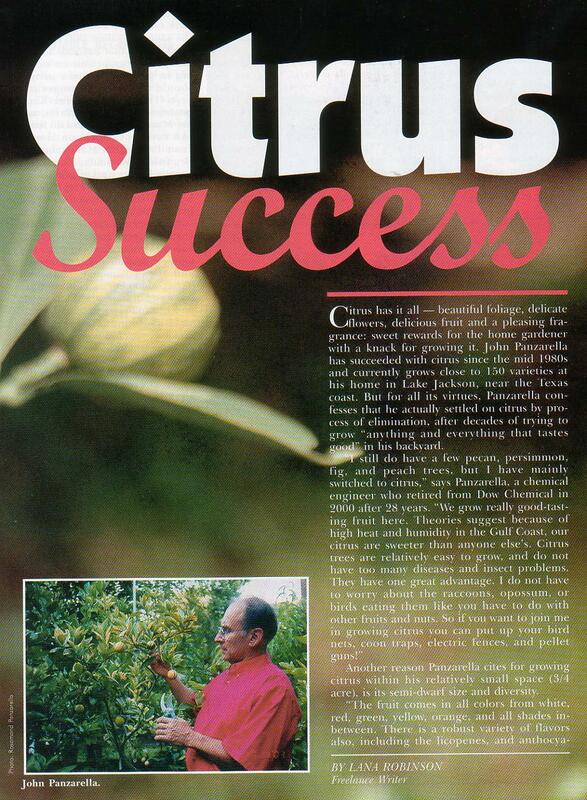 “Citrus Success” Texas Gardener, Sept/Oct. 2003. “Fruitful Hobby” Image, Brazoria County Magazine, Summer 2003.